RCA Corporation, founded as Radio Corporation of America, was an electronics company in existence from 1919 to 1986. Currently, the RCA trademark is owned by the French conglomerate Thomson SA through RCA Trademark Management S.A., a company owned by Thomson. The trademark is used by Sony Music Entertainment and Thomson SA, which licenses the name to other companies like Audiovox and TCL Corporation for products descended from that common ancestor. On August 4, 1914, the United Kingdom and France declared war on Germany and Austria-Hungary, starting World War I. Radio traffic across the Atlantic Ocean increased dramatically after the Germans cut Allied cable telegraphs. During the war, the United States Navy suppressed patents owned by the major companies involved with radio manufacture in the United States to facilitate the war effort. All production of radio equipment was allocated for the Army and Navy. The Navy sought to maintain a government monopoly of wireless radio; however, the wartime command system over radio was to eventually end by the tabling of the maintenance of government control by the U.S. Congress in 1918. The rejection of the government monopoly did not prevent the Navy from creating a national radio system. On April 8, 1919, U.S. Navy Captain Stanford C. Hooper and Admiral W. H. G. Bullard met with General Electric Company executives to ask that they not sell their Alexanderson alternators to the British-owned Marconi Company and its subsidiary Marconi Wireless Telegraph Company of America. The premise of the Navy's proposal was that if GE created an American owned radio company, then the Navy would secure a commercial monopoly of long-distance radio communication. This marked the beginning of negotiations by which GE would buy American Marconi and organize what would become the Radio Corporation of America. Original RCA logo, A later variation of this logo was revived by BMG for sound recordings after it bought GE's interest in the record company. The incorporation of the assets of Marconi Wireless Telegraph Company of America (including David Sarnoff), the Pan-American Telegraph Company and those already controlled by the United States Navy led to a new publicly-held company formed by General Electric (which owned a controlling interest) in 1919. The subsequent cooperation among RCA, General Electric, United Fruit, Westinghouse Electric Corporation, and AT&T laid the groundwork for significant developments in point-to-point and broadcast radio, including the new National Broadcasting Company. The Navy turned over to RCA the former American Marconi radio stations appropriated during the war. Admiral Bullard received a seat on the RCA Board of Directors for his efforts in establishing RCA. The end result was government-created monopolies in radio for GE and Westinghouse and in telephone for AT&T. The Navy's rationale that radio frequencies were limited and needed to be appropriated and put in use before other countries, primarily Great Britain, monopolized them first soon collapsed with the discovery in the mid-1920s of the practicality of the shortwave band for long-distance transmissions. The first head was Owen D. Young. At this time, David Sarnoff became general manager.RCA's charter required it be mostly American owned. The company became responsible for marketing GE and Westinghouse's radio equipment, and in a subsequent deal it also acquired the patents of United Fruit and Westinghouse in exchange for ownership stakes in those companies. As time passed, the company secured a large number of patents, including the superheterodyne concept. Some of RCA's early radios were designed so as to prevent the internals from being reverse-engineered. Over the years it continued to operate international telecommunications services, under the subsidiary RCA Communications, Inc. and later RCA Global Communications. By 1926, the market for commercial radio had expanded significantly, and RCA purchased the WEAF and WCAP radio stations and networks from AT&T, merged them with the already-owned WJZ (the predecessor of WABC ) New York to WRC (presently WTEM) Washington chain, and formed the National Broadcasting Company (NBC). In 1929, RCA purchased the Victor Talking Machine Company, then the world's largest manufacturer of phonographs (including the famous "Victrola") and phonograph records. This included a majority ownership of the Victor Company of Japan, or JVC. The new subsidiary then became RCA-Victor. With Victor, RCA acquired New World rights to the Nipper trademark. RCA Victor produced many radio-phonographs and also created RCA Photophone, a sound-on-film system for sound films that competed with William Fox's sound-on-film Movietone and Warner Bros. sound-on-disc Vitaphone. In 1930, RCA became a crucial and key tenant in the yet to be constructed landmark building of the Rockefeller Center complex, 30 Rockefeller Plaza, which from 1933 became known as the RCA building, now the GE Building . This critical lease in the massive project enabled it to proceed as a commercially viable venture. In 1939, RCA demonstrated an all-electronic television system at the New York World's Fair and developed the USA's first-ever television test pattern. With the introduction of the NTSC standard, the Federal Communications Commission authorized the start of commercial television transmission on July 1, 1941. World War II slowed the deployment of television in the US, but RCA began selling television sets almost immediately after the war was over. (See also: History of television) RCA labs was closely involved in RADAR and radio development efforts in support of the war effort. These development efforts greatly assisted RCA in their Television research efforts. RCA was one of the leading makers of vacuum tubes (branded Radiotron) in the USA, creating a series of innovative products ranging from octal base metal tubes co-developed with General Electric before World War II to the transistor-sized Nuvistor used in the tuners of the New Vista series of television sets. The Nuvistor tubes were a last hurrah for vacuum tubes and were meant to be a competitive technology for the relatively newly introduced transistors. RCA also partnered with Tung-Sol to produce the legendary KT88/6550 hi-fi vacuum tube. Their power in the marketplace was so strong that they effectively set the selling prices for vacuum tubes in the USA. Except for the main cathode ray tube (CRT), the company had completely switched from tubes to solid-state television sets by 1975. Antitrust concerns led to the breakup of the NBC radio networks by the FCC, a breakup affirmed by the United States Supreme Court . On October 12, 1943, the "NBC Blue" radio network was sold to Life Savers candy magnate Edward J. Noble for $8,000,000, and renamed "The Blue Network, Inc". It would become the American Broadcasting Company (ABC) in 1946. The "NBC Red" network retained the NBC name, and RCA retained ownership. In 1941, before the attack on Pearl Harbor , the cornerstone was laid for a research and development facility, RCA Laboratories, located along Route 1 and just north of New Jersey Rte 571 in Princeton, New Jersey. It was in this facility that myriad innovations and key technology such as color television, the electron microscope, CMOS based technology, heterojunction physics, optoelectronic emitting devices, Liquid Crystal Displays (LCDs), video cassette recorders, direct broadcast television, direct broadcast satellite systems and high-definition television would be invented and developed during ensuing years. (After 1988, the facility would be known as Sarnoff Corporation, a subsidiary of SRI International.) During World War 2 RCA organizations won 5 Army–Navy ‘E’ Award for Excellence in production . Also during World War II, ties between RCA and JVC were severed. In 1949, RCA-Victor developed and released the first 45 rpm record to the public, answering CBS/Columbia's 33⅓ rpm "LP". RCA Television Quad head 2" color recorder/ reproducer used at broadcast studios in the late 1960s, 70s and early 80s. It used a vertical scanning drum with head motion at 90 degrees to tape direction. 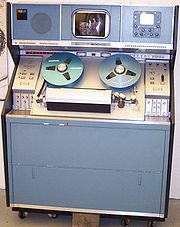 This unit was developed before the now-common helical scanning used in commercial and home tape machines. In 1953, RCA's all electronic color-TV technology was adopted as the standard for American color TV; it is now known as NTSC (after the "National Television System Committee" that approved it). RCA cameras and studio gear, particularly of the TK-40/41 series, became standard equipment at many American television network affiliates, as RCA CT-100 ("RCA Merrill" to dealers) television sets introduced color television to the public. In 1955, RCA sold its Estate large appliance operations to Whirlpool Corporation. As part of the deal, Whirlpool was given the rights to market "RCA Whirlpool" appliances through the mid-1960s. Because of their rarity and technological significance, RCA Merrill/CT-100 (and other early color television receivers) are highly sought-after collectibles. Attic "relics", especially with an RCA emblem, should be assessed by several knowledgeable and trustworthy antique radio or television collectors before acquisition. Despite the company's indisputable leadership in television technology, David Sarnoff in 1955 commented, "Television will never be a medium of entertainment". RCA was one of the eight major computer companies (along with IBM, Burroughs, Control Data Corporation, General Electric, Honeywell, NCR and UNIVAC) through most of the 1960s. RCA marketed the Spectra 70 Series (70/15, 70/25, 70/35, 70/45, 70/46, 70/55, 70/60, 70/61) that were compatible with IBM’s 360 series and the RCA Series (RCA 2, 3, 6, 7) competing against the IBM 370. These systems all ran RCA’s real memory operating systems, DOS and TDOS. RCA’s Virtual Memory Systems, the Spectra 70/46 and 70/61 and the RCA 3 and 7 could also run their Virtual Memory Operating System, VMOS. VMOS was originally named TSOS (Time Sharing Operating System), but was renamed in order to expand the system beyond the time sharing market. In fact RCA was credited with coining the term Virtual Memory. TSOS was the first mainframe, demand paging, virtual memory operating system on the market. The English Electric System 4 range, the 4-10, 4-30, 4-50,4-70 and the time-sharing 4-75 computers were essentially RCA Spectra 70 clones of the IBM System /360 and 370 range. RCA abandoned computers in 1971. In January 1972, Sperry officially took over the RCA base. RCA Graphic Services Division (GSD) was a pioneer in computerized typesetting, marketing the Rudolf Hell Digiset as the VideoComp 800 with a Spectra computer running the FileComp composition system. The system would also typeset from tapes composed on a mainframe using the RCA Page-1 composition system. When RCA left the computer field, support of the VideoComp was taken over by Information International Inc. (known in the typesetting industry as Triple-I). RCA was a major proponent of the eight-track tape cartridge, which it launched in 1965. The eight-track cartridge initially had a huge and profitable impact on the consumer marketplace. However, sales of the 8-track tape format peaked early on as consumers increasingly favored the compact cassette tape format developed by competitor Philips. The ambition and business acumen of David Sarnoff led to RCA becoming one of the largest companies in the world, successfully turning into a conglomerate during the era of the companies greatest success. However, in 1970, at 79 years old, Sarnoff retired and was succeeded by his son Robert. David Sarnoff died the next year. During the 1970s, RCA Corporation, as it was now formally known, ventured into other markets. Under Robert Sarnoff's leadership, RCA diversified far beyond its original focus on electronics and communications. The company acquired Hertz (rental cars), Banquet (frozen foods), Coronet (carpeting), Random House (publishing) and Gibson (greeting cards). Despite this diversification the corporation became plagued by financial problems. Robert Sarnoff was ousted in a 1975 boardroom coup by Anthony Conrad, who resigned a year later after he admitted failing to file income tax returns for six years. Despite maintaining a high standard of engineering excellence in such fields as broadcast engineering and satellite communications equipment, ventures such as the NBC radio and television networks declined. Forays into new consumer electronics products, such as the SelectaVision videodisc system, proved to be money losers. While maintaining profitability, in 1983, RCA switched manufacturers of its VHS VCRs from Panasonic to Hitachi. The SelectaVision videodisc system, not to be confused with the same trademark RCA applied to their VCRs, was then abandoned in 1985 in a write-off of several hundred million dollars. Its chief competitor, videotape, held two key advantages: recordability and lower cost. Sales of the videodiscs continued through 1985. VCRs quickly took a dominant market share, just as the market for publicly traded equities was growing rapidly. RCA could not take part in that field, and its competitors showed superior performance. In 1984, RCA Broadcast Systems Division relocated from its Camden , New Jersey , location to the site of the RCA antenna engineering facility in Gibbsboro , New Jersey. Over time, all of the broadcast product lines developed in Camden were terminated or sold off. Most of the buildings at the Camden site were eventually demolished, save for the original RCA Victor buildings, having been declared national historical buildings. Business and financial conditions led to RCA's takeover by GE in 1986 and its subsequent break-up. GE sold its 50 percent interest in what was then RCA/Ariola International Records to its partner Bertelsmann and the company was renamed BMG Music for Bertelsmann Music Group. GE then sold the rights to make RCA and GE brand consumer electronics products, notably television sets, to the French Thomson Consumer Electronics, in exchange for some of Thomson's medical businesses. After Thomson Group's takeover, many owners of RCA branded products began to see steep declines in quality. RCA Laboratories was transferred to SRI International as the David Sarnoff Research Center, subsequently renamed Sarnoff Corporation. Sarnoff Labs was put on a five-year plan whereby GE would fund the labs' activities 100 percent for the first year. That funding declined to zero or near zero after the fifth year of Sarnoff Labs' operation. This required Sarnoff Labs to change its business model to become an industrial contract research facility. The only RCA unit GE kept was the National Broadcasting Company. GE sold the NBC Radio Network to Westwood One and all of its radio stations to various owners. For information on products bearing the RCA name manufactured since 1986, see RCA . Because of their popularity during the golden age of radio, their manufacturing quality, their engineering innovations, their styling and their name, RCA antique radios are one of the more sought-after brands of collectible radios. The historic old RCA Victor Building 17 in Camden, New Jersey , was redeveloped in 2003 as a high-rise luxury apartment building. A former RCA facility—shut down in 1991—is located in Taiwan's northern county of Taoyuan. There have been rumors (none confirmed) about the company's plants polluting groundwater with toxic chemicals which led to a high incidence of cancer among former employees. A spokesman for RCA's current owners denied responsibility, saying a study conducted by the Taiwan government showed no correlation between the illnesses and the company's facilities. The area was declared a toxic site by the Taiwanese Environmental Protection Agency. Both GE and Thomson spent millions of dollars for cleanup, removing of soil and installing municipal water treatment facilities for neighboring communities. The former RCA facility located in Lancaster, Pennsylvania , also has a marred environmental legacy. RCA owned the facility from the late 1940s to June 1986. According to EPA's "Toxic Releases for Reporting Year 1987", the facility released over 250,000 pounds of pollutants per year in stack emissions. Investigated by the EPA in the late 1980s and early 1990s, the main contaminants in the groundwater at the facility are trichloroethylene (TCE) and 1,2-dichloroethylene (1,2-DCE). Contaminants were also detected in monitoring wells on the east side of the Conestoga River in 1991 and 1992 in Lancaster. Another site having contamination issues is the Intersil Facility in Mountaintop, Pennsylvania, which RCA operated in the 1960s and later sold to Harris Semiconductor. The shallow and deep groundwater aquifers beneath the facility contain elevated levels of volatile organic compounds ("VOCs"). Another former RCA site is located in Burlington, Massachusetts . Between 1958 and 1994, the site was used as an industrial facility, primarily for manufacturing and testing military electronics equipment, generating hazardous waste. Contaminants of concern include VOCs, TCE, toluene, ethylbenzene, and xylenes. Another RCA facility in Barceloneta, Puerto Rico, generated wastes containing chromium, selenium and iron. Four lagoons holding chemical waste drained down into the limestone aquifer. Robert N. Sobel: RCA. New York: Stein and Day Publishers, 1986. ISBN.